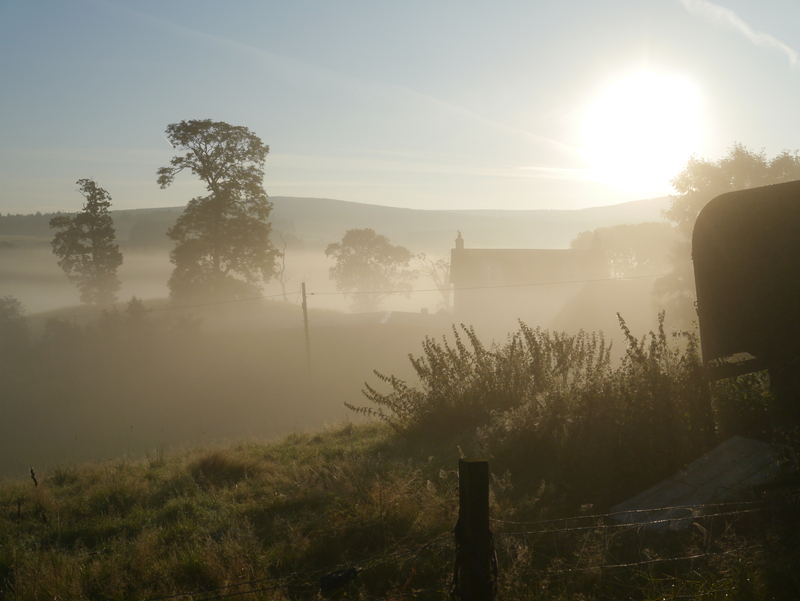 leaving one of those days that makes you cherish autumn. The air is crisp, and the sky clear. Sounds travel. Soon the hillsides will be dressed in motley. Noticeable though was the start of the leaf litter. But it was crinkly and dry. The wet and slippery stuff will be later. For now the slightest of breezes brought more confetti, more autumn leaves, drifting by the window, as someone once sang. And it was a day as mellifluous, as smooth and velvety, as if Nat himself was on that bike. In the garden the laburnum is yellowing, shedding; and the rowan is heavy with berries, mellow fruitfulness perhaps, bright red as the leaves hold their colour just a bit longer. The chestnut takes on the camouflage of the flak jacket, and the beech gives no hint of the copper, yet. But the silver birch is giving way. The seasons are changing. And things were happening further afield. Long have I been conscious that these particular acres have been spared the intrusion of the magpie. But they’ve found us now, just a couple. Where will it end? And there is another stranger in the skies. 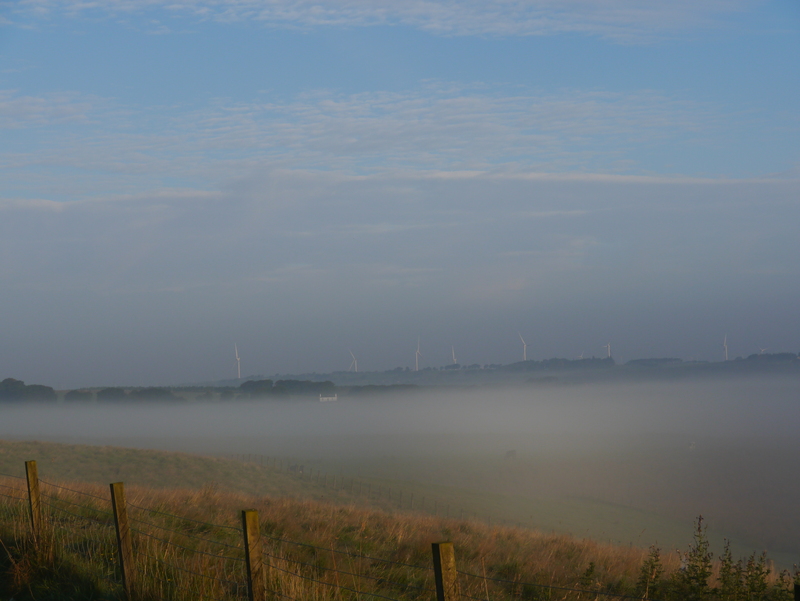 It lifted from poles twice today as I went past, twice in fact, a mere hundred yards either side of the cottage. Big it is, big and dark. Bigger and darker than the buzzard. You see, we are learning Simon Barnes’ techniques here. Now I know a buzzard, see them daily. The Urchins can spot then from a distance. This is no buzzard, bigger and darker. And that gets me thinking, pondering even. For bigger and darker the possibilities are not many, not in these parts. And I recall a chap, not far away, who keeps and flies a few raptors. He had an escapee a year or two back, a golden one apparently. But it wasn’t that big; and I remember a day racing across Mull 11 months ago, with big Mark from the BBC. So it could have been something resting, whilst released from the gauntlet. Or it could be something else. I’ll watch the skies a bit closer, and I’ll look for any trailing jesses. Bigger and Darker. And magpies too. What is the world coming to? 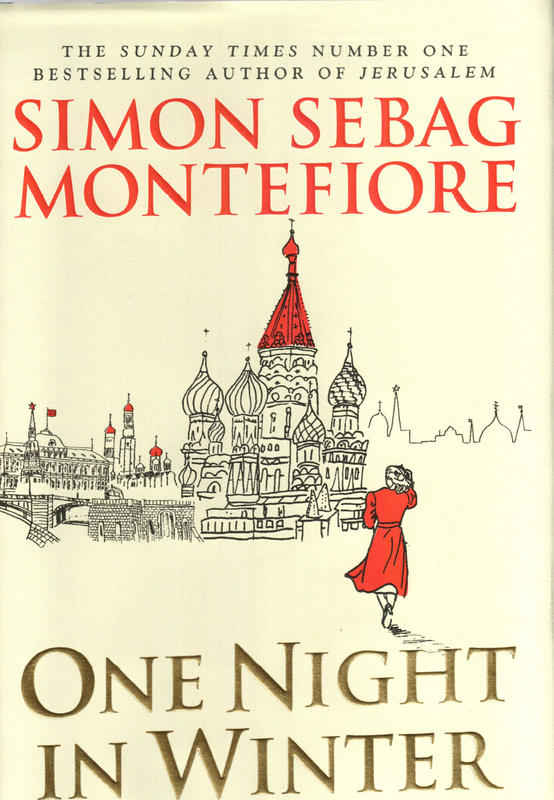 Those of you who read Sashenka a couple of years ago, will be delighted to learn that Simon Sebag Montefiore has delved again into the world of historic fiction. As he did then, and in the manner of others such as Harry Thompson with his This Thing of Darkness, he weaves fiction around fact. But where Thompson built dialogue, Montefiore goes further, enhancing the tale with his own characters in the same historic events. And as he did with Sashenka, he has created a work of immense craft. Indeed he has exceeded expectations with his second volume of fiction. His latest is One Night in Winter, again in Russia, Moscow this time, and a later period. Montefiore takes us to the end of WWII. Russia exalts in the defeat of Nazi Germany, through great sufferance; and America is about to announce, and drop, the worst weapon of all, and to become a super-power. These are the dark days of exile, of gulags, and of whispers overheard, meanings implied. People spoke in code, avoiding names; conversations were whispered in bathrooms with taps running. There were men of power, and their names were Beria, and Stalin. Manipulation. Building conversations, crafting dialogue, Montefiore introduces his own characters around very real events. And we become engrossed, watching, mesmerised, as ripples spread outwards. We start with a group of children, taking their school studies one stage further. And we learn of connections, of wider families. And we discover what goes on in the corridors and rooms of the Lubianka, in the 1940s. Now I’m not about to tell you here the basis for the tale, far less the outcome. We focus on one night, visit earlier events, and move forward a decade, then another two. But I am going to suggest that you get yourself a copy and delve in. You won’t regret it. It might be an emotional trip. And I’m pleased to say that the author has also added another name, another couple of volumes, to a list of books I’d like to find. More on them later, perhaps. 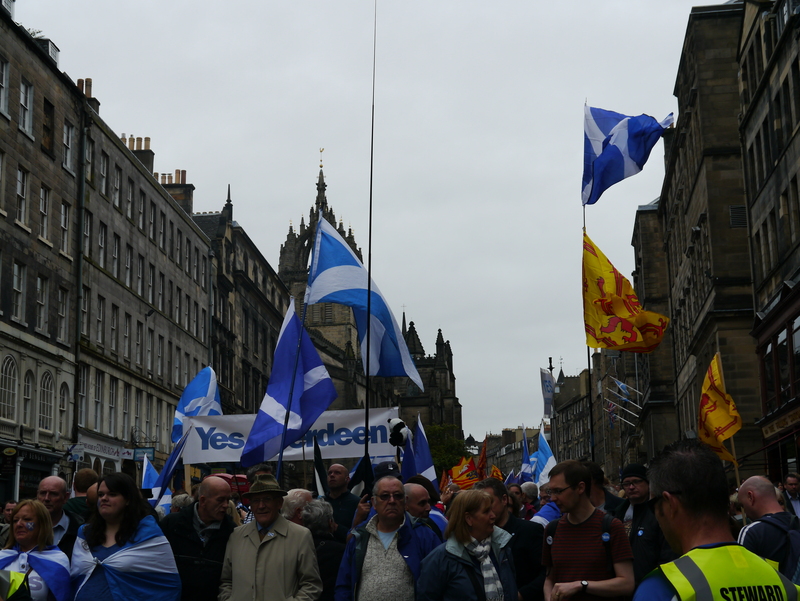 It was a pretty special day as we gathered on the Royal Mile. There were colours galore. Many were alone; alone among tens of thousands of friends. There were grannys and toddlers, and every age in between. A nation rose, and rises yet. As I mentioned last year, rising and marching, demonstrating, is not something that comes easily to many. But the streets filled. This was a full hour before proceedings began. The skirl of the pipes had yet to fill the air. For some bizarre reason I found myself in the front row. And the press pack gathered in front. I gave a few words to a reporter from Norway; photos were taken from many parts, including a lovely lass as part of her photography studies at a local high school. Then the film crews came in, and the VIPs. It was a strange day. I was entrusted with the jacket of the Deputy First Minister, as she did a few words to camera, and some stills. Smiling? Nicola by the end of the day I was all smiled out. But there was something about the battery of cameras at the front of the march. Something missing perhaps. In due course we made it up to the top of hill, a place I’d never visited before, despite all the visits to Edinburgh. There were advantages at the front; a place stage-front to start with. For those at the back, and the tail did not arrive until an hour later, made do with big screens, and will get the speeches they missed thanks to the ‘net. It was a colourful scene. For we are not the only nation that strives to have our own say. The Dragon of Wales was joined by others: South Tyrol, Sardinia, Catalonia, Venice and more beyond. Spotting faces in the crowd brought moments to savour. Ruth Wishart, who spoke so brilliantly last year was marching again. And she brought a friend, the latest recruit to the world of the blog, none other than Derek Bateman who will, I hope have many words for us in the year ahead. And there were anonymous friends from websites, names and blavatars galore. From the stage we were richly entertained, hosted by Elaine C and Hardeep; the rabble roused by speeches from across the spectrum – from Labour and the Greens, the socialists too, and from the party that made it all possible. Nicola Sturgeon was immense, a leader in waiting. And the ovation for the First Minster must have been heard across the Forth. A special mention too for both Tasmina Ahmed-Sheikh and Aamer Anwar. Stonking stuff. If I can pick a couple of prize moments I’d like to bring you Alan Bissett, reading his Vote Britain. I’ve heard him read in a small gathering in a local hall; and I’ve heard him read the same piece in front of the masses. There are versions available online, but I’ll watch for yesterday’s appearing and post it for you. Food for thought. But above that we had a song, with Sheena Wellington, leading the stage, leading the gathering, with A Man’s a Man for a’ That, and we remembered again the re-convening of our parliament back in ’99. There were more than a few eyes being wiped, and it wasn’t the wind at the top of the hill. And we had Eddi Reader, and granddad’s flag, from a march in the 30s. And then it was over. And we watch the news bulletins and the press announcements. Crowd numbers. I was told by a police officer early in the morning they had planned for 10-15,000. Double it, thought I, aloud. She gasped. So the Beeb says 8, but they were at that game last year. And double it was pretty much what the police should have done. For the best of the news bulletins, we have to head overseas, with this piece from Russia Today, who were chatting and interviewing at the front of the march from early on. They were there with crews from France and Spain, and several others. Our own broadcasters were noticeable by their absence. No surprise there. I had one of those joyous days yesterday. The trains were on time; the sun shone; and I was surrounded by books. These were real books, physical books, and real people. In a total of seven hours on trains, most of them hugely enjoyable, I encountered only one e-reader. There were plenty of books on the go, one was left behind on the seat for the next person that came along, deliberately. And there were only two annoying instances of that tinny racket that escaped earbuds, even in the ‘quiet’ coaches. No one yelled into their phone – I’m on the train. And there was wifi, which was a brilliant facility. Despite the need to spend time with the latest Wanderlust, a brilliant issue covering the mysteries of the Avebury Stones, and the Nazca Lines and much more; and there was Slightly Foxed and notes of more books to read, authors to catch up on – Christopher Rush is still working on his Odysseus novel and I’m waiting patiently; Richard Haydn I want to find, and Tolstoy’s Hadji Murat. Despite all that I did have to keep an eye on emails and catch up with events. One of those events takes place today, more trains. 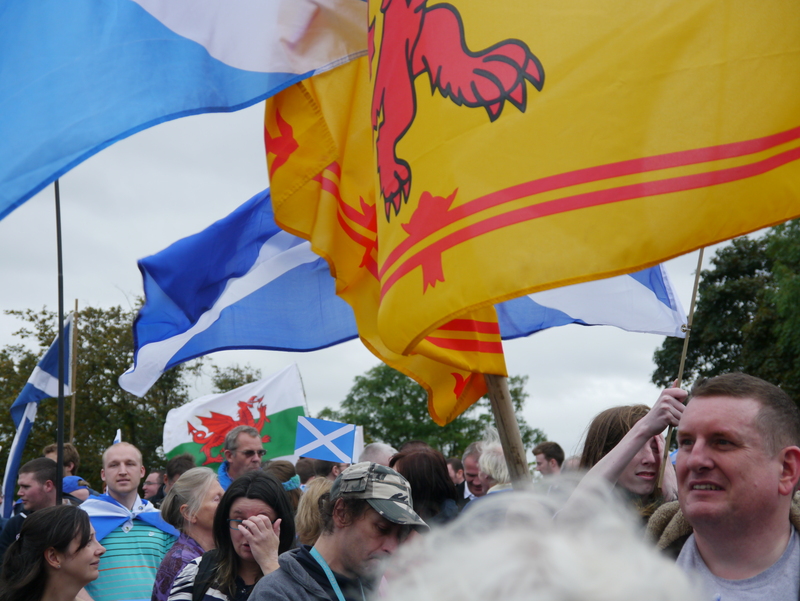 It’s a jolly to the capital, a March and Rally; speakers of the highest quality; and lots and lots of saltires. I’ll have more on that later but it’s going to be a great day. Anyway, back to The Written Word. Yesterday’s trains took me down to York, to the first day of the annual PBFA Book Fair. Usually I attend on the Saturday but this year I had the advantage of being there for the opening, before the dealers have been snapping up the bargains. But I didn’t expect to see a queue of a couple of hundred waiting on the doors to open. We are talking here of second hand books. This though is no ordinary book fair. A couple of hundred dealers gather with the pick of their stock; the things they hope will sell. It was busy, annoyingly so, as browsers bumped and got in the way and access to shelves required much indrawn breath at times. There was a noticeable emphasis in authors who recently laid down their pens for the final time. There was much Seamus Heaney, PLF too, their signatures now inflated as no more were possible. I had a list of things to keep an eye out for, but I didn’t find them. Actually I found one, but not in the prized and sought after, by me anyway, first edition. I had an eye on a couple of others I had found on my forays round the hall. But time disappeared and as I was finalising my buying intentions a glance at the time had me gasping. The day was done; the shuttle bus back to the station was the next target. The pavement was bare. I had just missed one. Twenty minutes service; the train left in thirty. The driver need a pee; two passengers wanted an unscheduled stop. The train was platform 11. But I made it, and here I am. Exhausted after a good day out. And isn’t it great that the written word still attracts. I’ve not seen the York book fair busier. And there was only one e-reader on the train. 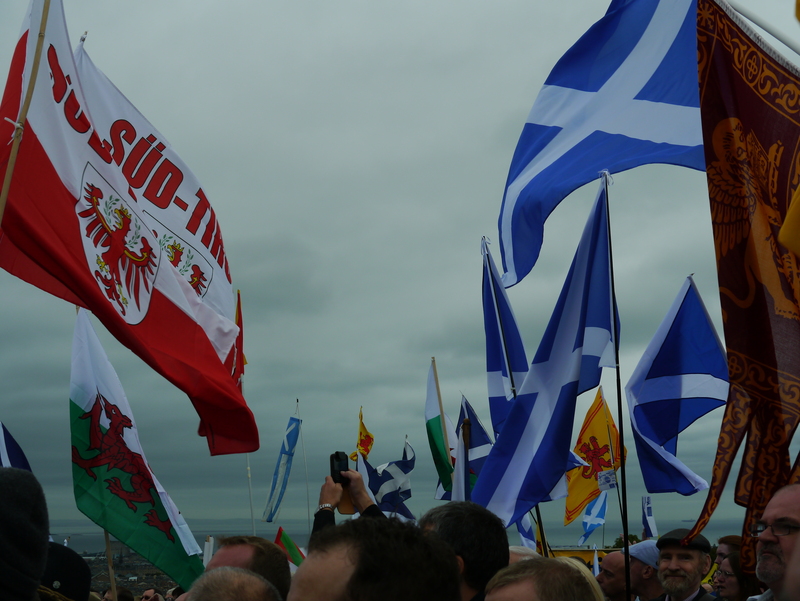 Now, where’s that saltire flag? Derek Bateman again folks. This is his opening piece from his non-satirical blog. Wow. And while we’re at it, here’s the next in the series of wee films you’ve been watching lately. Gordon MacIntyre-Kemp, from Business for Scotland. Watch, Listen, Learn. So are we really better together? You decide. And the voice of Youth. Go Saffron!